The coastal town of Albany, Western Australia had a surprise visitor this week, in the rather large form of a southern elephant seal. Although still just a juvenile, this 2.5m male is thought to weigh-in at somewhere between 500 and 700 kg – not exactly something you want to find in your front yard! But when Rhonda Bell looked outside, that’s exactly what she found! The seal has been basking on Rhonda’s beachside property on-and-off over the last week, occasionally moving up and down the coastal road. Local residents have been turning up by the dozen to check out the unusual marine mammal. Southern Elephant Seals breed in colonies on South Georgia, Macquarie Island, Heard Island and the Kerguelen Islands. For most of the year they live in the cold oceans of the sub-Antarctic. However, at this time of year winter fronts can sweep in various migratory animals to Western Australia. Since elephant seals are used to travelling long-distances (records of an elephant seal travelling 18,000 miles over a year), no doubt this one will none the worse for wear. 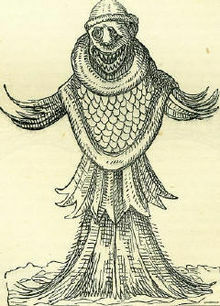 The ‘sea monk’ was a monster from the North Sea – not sure if there’s a Redmap category for this! But admittedly, when something strange appears in your local patch of ocean, how are you supposed to figure out what it is? One new initiative is trying to map the occurrence of ‘uncommon’ marine species sightings using citizen science. Started by the Institute for Marine and Antarctic Studies (IMAS), the Redmap project invites Australians to share sightings of marine species that are unusual in their local seas. Over time, Redmap will use this information to map changes in species distribution and ranges and try to determine the cause (e.g. changes in the marine environment). The added benefit to you, is that once a sighting is logged it goes to a scientist for verification. This means that you can get an expert opinion to confirm whatever strange species you come across. Another good reason to go check out the ocean! You never know what you might find, and it might just help scientific research! This entry was posted in Citizen Science, Seals and Sea Lions and tagged Elephant seal, Marine biology, Science on July 20, 2013 by Sarah Marley.